Florida Car Rental Locations, Best Travel Routes To Reach The Keys! Making arrangements for your Florida car rental before you arrive helps get your Florida Keys vacation off to a smooth start. To help plan your vacation to the Florida Keys, you'll also need a good Florida Keys map. A detailed Florida map is also a good idea, especially if you're flying in to Miami, Tampa or Orlando before you hire your car and drive south. Having a map in advance makes it possible for you to 'see' the area and plan your vacation to the Florida Keys in advance as you'll know where the different Florida Keys attractions are. This is especially helpful because plans for your Florida Keys trip will likely be fluid due to changes in weather, unexpected local events, and personal preferences. To help with your Florida travel plans, I've included information on where Florida car rental companies can be found at the different airports you're likely to land at. You can get your car for rent when you land, but you're better off to make your car hire arrangements in advance. This helps avoid any nasty surprises so your Florida Keys travel plans go as smooth as possible. You also may be able to take advantage of any car rental discounts or promotions. Often, by reserving online you'll have more flexibility as to type of vehicle you want to reserve and you'll also be able to save money on the transaction. To help you save time and money I recommend an affiliate of mine, Airport Rental Cars. With over 18,500 locations they can get you the best prices on all major car types from the top 17 car rental brands. No matter where your travels take you, you know you'll be able to affordably secure your car rental with ease. They also have a reserve now, pay later policy, and you can apply discount codes for additional car rental savings. 3. You will actually be able to get a car. In peak season rentals can be hard to get or at a premium. 4. You will be able to reserve the car you want, at the price you want to pay, instead of getting stuck with one you don't want to drive or get one that is pricier than you would have preferred. So you know, as an affiliate of theirs if you reserve a vehicle through any of the banners or links below, I stand to earn a small commission. The item does not cost you any more, this is called being an "affiliate." The following banner takes you to a handy widget so you can check pricing on the most popular car models with the top car rental companies and secure the best price for your vacation. The important thing about your Florida car rental is remembering to make the arrangements as soon as possible. 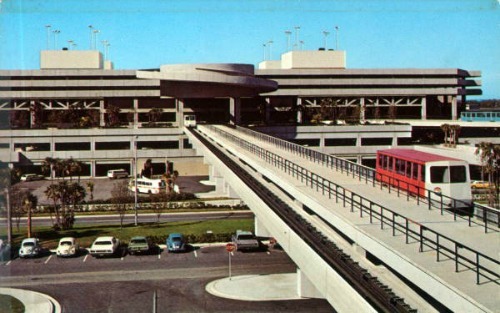 If you arrive in Orlando, Orlando International Airport has the largest car rental market in the world due to the heavy influx of tourists on a yearly basis. For a travelers convenience, most of the major Orlando car rental companies are located at the Orlando, FL, International Airport. Car rental pick up is also easily accessible with no need for a shuttle to take you to the car rental. All Orlando airport car rental companies are located at Ground Level and can be found in Terminal A and Terminal B. The Off-Site Orlando Car Rental Companies provide free shuttle bus service to their different car hire locations. Renting offsite, from companies located near the Orlando airport can save you time, but it's not always convenient. It just a combination of factors you need to weigh so you get the best car rental for you. If you arrive at Tampa International Airport you'll want to get your Florida car rental right away so you can get on the road and travel south the Florida Keys. Many of the Tampa car rental companies have rental counters at the Tampa airport. They're conveniently located in the Red Baggage claim area and also across the walkway from the Blue Baggage claim area. There are also Tampa car rental companies off-site but you can still get to them easily. Courtesy vehicle service to these car rental companies are available at the Baggage Claim level. Just look for the Commercial Ground Transportation Quadrants located in the 4 corners of the Baggage Claim level. If you want to make sure you have a car available when you arrive, and that's it's the type of car you want to drive then you should check out the best prices and selection available through Airport Rental Cars. You'll find you'll have peace of mind and will likely save money as opposed to waiting til you arrive tired at the airport and then have to go through the car selection and paperwork process. When traveling in your Florida car rental, if you're in central or south Florida, it won't take long for you to get to the Florida Keys. If you're going to be in the Orlando FL area I would suggest getting your cheap car rentals at Orlando, FL, International Airport so you have less downtime once you arrive. Then when you're done renting at the Orlando, FL, International Airport you can then take the Florida Turnpike which is a toll road. So you know turnpike costs, your Florida car rental is a 2 axle which means the toll fee will be well under $20.00. The big advantage to traveling on the Florida Turnpike is that it will save you from cutting straight east then paralleling the congested Atlantic Coast the way Interstate 95 does. Interstate 95 is the major highway that runs north and south along the Atlantic Ocean. It travels through all of the smaller and larger coastal cities. If you're expecting to catch a glimpse of the ocean driving this route with your Florida car rental, you're mistaken. You won't be able to see much, if any of the ocean. If this was your reason for choosing I-95, save yourself some time. Interstate 95 will let you see more of urban Florida, but you'll also get to experience greater congestion, and slower Florida travel times. The Florida Turnpike helps you avoid the Interstate 95 traffic, and will get you to your Florida Keys vacation destination faster. Of course if you were originally vacationing in the Miami area you would have flown into MIA. For a car rental Miami International Airport is easy for pick up because you can go to the Miami Rental Car Center. The Miami Rental Car Center is in one large, convenient place not far from MIA. You'll also find it even more convenient if you've reserved in advance the type of Florida car rental at Miami, FL, International Airport . This way you can get get the car you actually want, as opposed to just what's currently available. 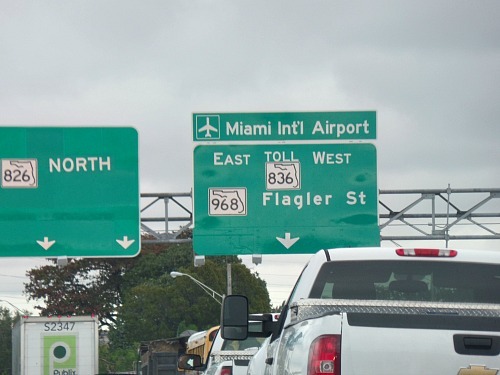 After you leave the Miami International Airport and have picked up your Miami car rental at the Miami Rental Car Center, you can then follow signs to the Florida Turnpike as Interstate 95 ends at the northern section of Miami. The Turnpike travels south and will take you directly to US Highway 1 where it ends at the Homestead / Florida City area. From here you'll begin your leisurely journey south on US Highway 1 to the Florida Keys! Tampa is a major city that's typically the furthest north point tourists visit, when planning a Florida Keys vacation. It sits somewhat central in the peninsula on Florida's west coast. This is a longer drive so for the sake of speed and convenience sake, you'll want to have a car rental so you can make the trip comfortably. I would suggest when traveling south from Tampa in your Florida car rental, that you do not take the Hwy 80 exit off I-75 at Fort Myers. 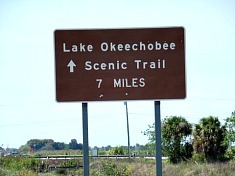 This road takes you east and around the bottom of Lake Okeechobee. There's not much sightseeing in this area since it's primarily wide open agricultural land that is sparsely populated. You also won't be able to see much of Lake Okeechobee either due to the large berms. 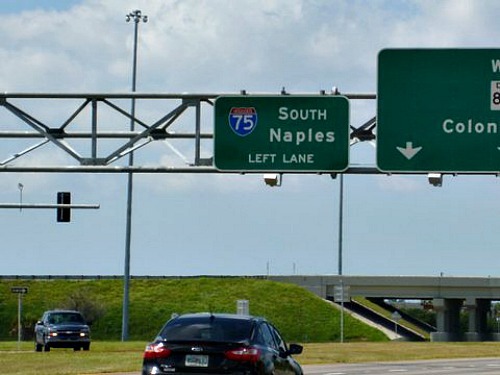 You're fastest route will be to stay on I-75 traveling straight south to Naples. 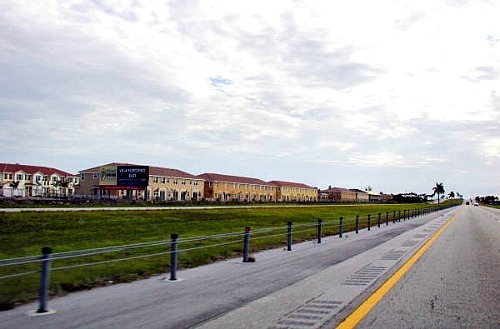 At Naples the road turn east and you'll continue on the toll portion of Interstate 75 called Alligator Alley Parkway. This is now a toll road for both east and west bound traffic. When you reach the toll section, you'll need to get into the appropriate lane to pay, since you won't likely have the Florida SunPass on your car's front windshield. 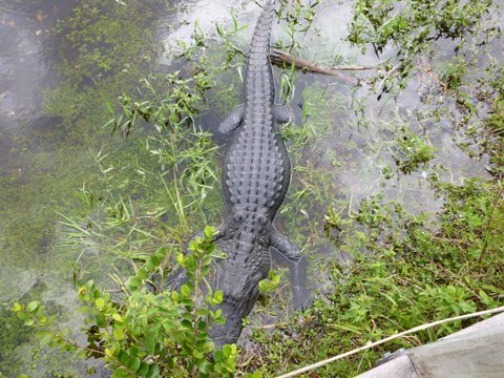 In the past, Alligator Alley was one of the best places to see Florida alligator. They absolutely littered the highway shoulders and ditches. 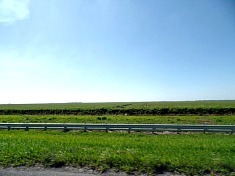 The first time my husband and I drove Alligator Alley I felt like a little kid. My husband's sense of concentration wore a bit thin when I couldn't contain my excitement. I kept pointing out all the alligators littering the road, yelling, "Look at that one! Oh, there's another two. Did you see that one?" After a while his patience wore thin, and he told me that he didn't need my help in spotting them. Even though he was driving, it was impossible for him not to see them as they were absolutely everywhere you looked. 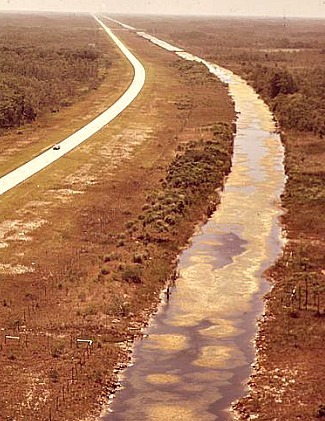 Unfortunately Alligator Alley is not what it was back then. It's Interstate 75, and as such it's an important 4 lane highway leading to Miami from the west coast. The number of Florida alligators along this stretch had become so dense, that no doubt they were a hazard to traffic. Now this whole section of I-75 has fences running on the far side of the ditches for both the east bound and west bound roads. The fences seem to have contained the alligator, and when you drive this fast moving road you're not likely to see any of the alligator Florida is famous for. It's unfortunate because it was such an amazing stretch of highway, but safety must come first - for the alligators and for us. In your Florida car rental you'll travel on I-75 until your reach the outer regions of Miami. Make sure you stay on I-75 and that you don't pick up I-595 by mistake. Then as I-75 turns south, keep a watch out for your intersection with the Florida Turnpike. By merging onto the Turnpike at this point, you'll avoid the greater congestion of merging with I-95. It's also faster, and less frustrating then driving on a number of back roads which can quickly get you lost if you take a wrong turn. Once you're on this major road there will be traffic, but for the most part everything should travel smoothly. 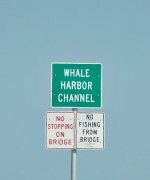 In less than 40 miles you'll be at Florida City and on US Highway 1 which becomes the Overseas Highway in the Florida Keys. You now can see that you have numerous Florida travel options when it comes to traveling in your car rental to reach your Florida Keys vacation destinations. You'll find that having a Florida map and a map of the Florida Keys while planning your Florida vacation, and while driving will make everything easier. Once you're on the road, maps will give you a better idea of where you are, they put the whole region into perspective, and you'll have backup for when the GPS isn't reliable or working. Unfortunately GPS systems can be more than a bit misleading, and a good Florida map is a cheap investment that will save you time, frustration, and keep you from getting lost. Below, I've included links to these helpful maps as well as to a variety of informative travel videos and DVD's, all conveniently available for you through Amazon.com. This is the beginning of your incredible Florida Keys vacation. The road you take will lead you through Key Largo, and down to Key West FL. Along the way you'll see unbelievable sights and do absolutely amazing things. Enjoy your Florida Keys vacation, travel safe, and welcome to paradise!